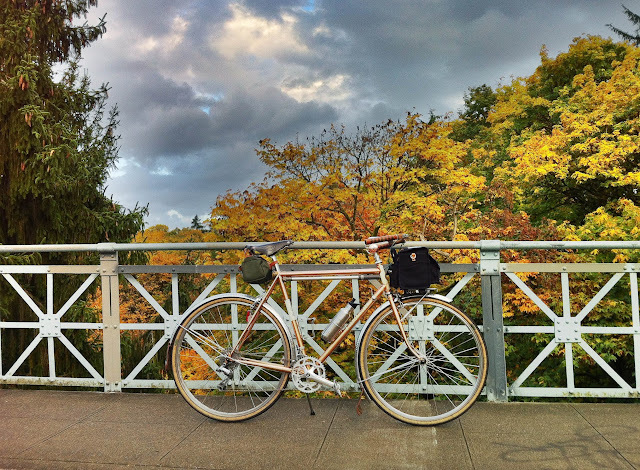 I commute 4 days a week from North Seattle (Maple Leaf) into Downtown. I generally leave my work clothes in my office so I don’t need to carry much on the bike, and after a few years of this routine, I’ve been able to whittle down my normal load. That said, I often try to bring in donuts for the crew. I also occasionally enjoy a nice fresh growler of pub stew (Fremont Brewing Co. is the current favorite). Since I like to keep this stuff off my back, I have really found baskets to be a godsend. If you can get past the dorkiness, they are really versatile. I do prefer the basket on the front of the bike. I had a dual basket setup on my mountain bike commuter for a while, but I found that mounts/dismounts were sometimes causing painful dings when I swung my leg around and caught the corner of the basket. I also didn’t like the load hindered by the seat/light/toolbag. This stuff got in the vertical plane, and just made the basket less effective. 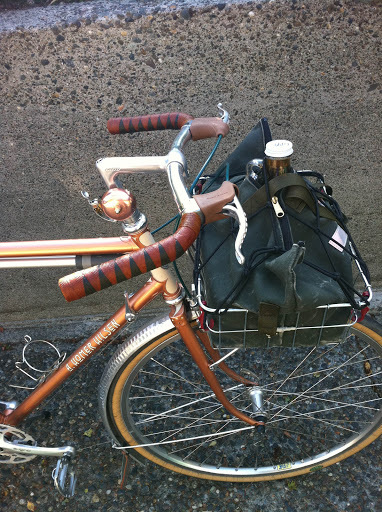 I’m a convert to front racks, baskets, and nice canvas bags. 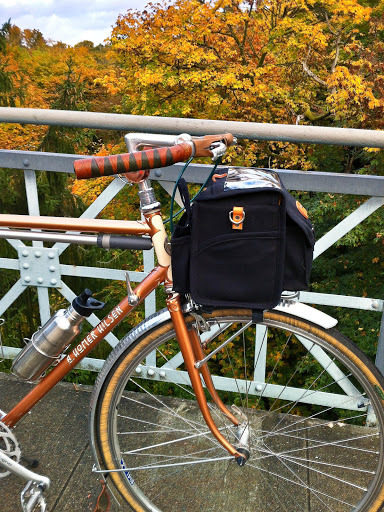 I currently use an Acorn Boxy Rando bag on my Riv, and a small Sackville Saddlesack for tools. 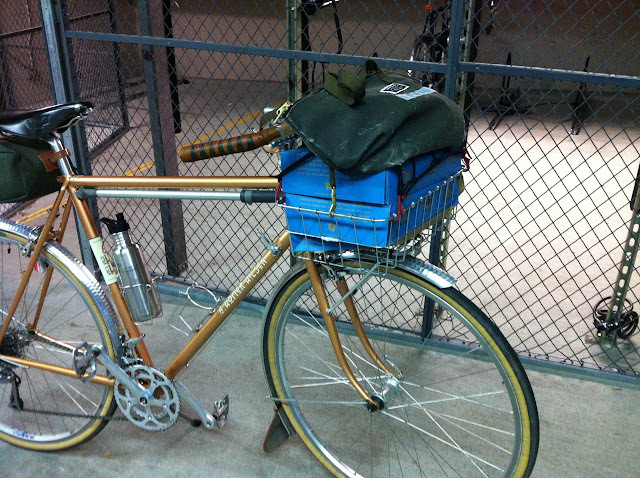 On my “donut bike”, I have a medium sized Wald basket with a Riv Shopsack that I totally love. I was planning to try out the “low-trail” design, but I’m having trouble justifying getting a new bike just to test this. I recently rode a few low-trail bikes at my LBS. I tried a VO Polyvalent, and a Rawland rSogn, but they felt not too much different than my Hilsen in terms of stability with a front load. I think I just key into trail less than some. I am currently using a Mark’s Rack on this bike. As I want a bit more platform for the Rando bag, as well as the basket I have been known to sport, I ordered a Nitto/Riv Platrack to add to this. I’m probably going to experiment with the struts. They are supposed to run to the eyelets at the front axle, but I’m more interested in having the same supports from the mid-fork eyelets hold this guy in place. I think it would look cleaner. I’m also worried about having more reinforcement from the bottom of the fork, as it may stiffen up the fork in a bad way. It’s probably psychological, but I’ll see if I can get a quantifiable feel for this.